A one stop shop for home leisure products. 6ft Crucible 2-in-1 Snooker and Pool Fold Up Table. 6ft Crucible Folding Pool and Snooker Table. This 6ft Crucible Table is a versatile and space-efficient table that can function as a snooker and pool table at the same time. It includes a set of 2 Inch snooker & pool balls, scoreboard, 2x 48 cues, triangle, and chalk for a complete gaming setup. This 6ft Crucible 2-In-1 Table has a smart black wood finish and 18mm thick playing surface covered with green wool-mix cloth. Easily adjust the table to a comfortable playing height with its adjustable height leg levellers. This table folds vertically to just 10cm deep so you can save space in the room. High response cushion rubbers, netted pockets, and metal sub frame make this 6ft Crucible 2-In-1 Foldup Snooker and Pool Table stylish, fun, and durable. This wood bed (non slate) table is ideal for the family home and will provide hours of great fun. 6ft foldaway table in smart black wood finish with green cloth. Substantial metal sub frame for solid stability. Quick & easy foldaway to just 10cm deep when not in use. Full-size quality high response cushion rubbers. 18mm thick composite playing surface covered with hardwearing green wool-mix cloth. Strong netted leatherette-covered pockets with metal braces. Designed for the professional player at home. Includes a full-size set of 2" professional snooker & pool balls, 2x 57" cues, scoreboard, triangle & chalk. Dimensions Assembled: L183 x W93 x H82cm. Dimensions Folded: L183 x W93 x D10cm. Carton Size: L192 x W103 x D12cm. Homegames stock and sell a vast range of games and leisure equipment for the home and garden. We are constantly adding new products to the site and also have many special offers, so be sure to keep a look out. We are based in Cheshire and have over 40 years experience in the Leisure Industry. Many products are available to view in our showroom. Please call prior to visiting to confirm. Included in this range are products such as football tables, table tennis, air hockey tables, basketball hoops, trampolines, jukeboxes, dart boards, football goals, multi games tables, garden games and more. We may require you to return the faulty product first. All goods are inspected by us for quality/damage before despatch. Please note we will always try to reply to emails asap. If we are unable to reply straight away then you will get a response within 24 hours. Sign up today for our official NEWSLETTER & get up to date with our new arrivals and also get our sneak peaks, tips and exclusive offers. 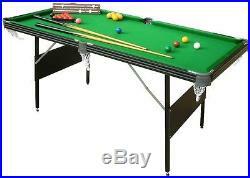 The item "6ft Crucible Pool or Snooker Table 2-in-1 Fold Up Table with Game Accessories" is in sale since Monday, August 22, 2016. This item is in the category "Sporting Goods\Snooker & Pool\Pool Tables". The seller is "homegamesuk" and is located in Stockport.